I found it interesting that recently my blog stats have shown a huge number of hits from various pins on Pinterest for my 2013 Calendar circles. I found this odd, given that the 2013 version is really not useful. 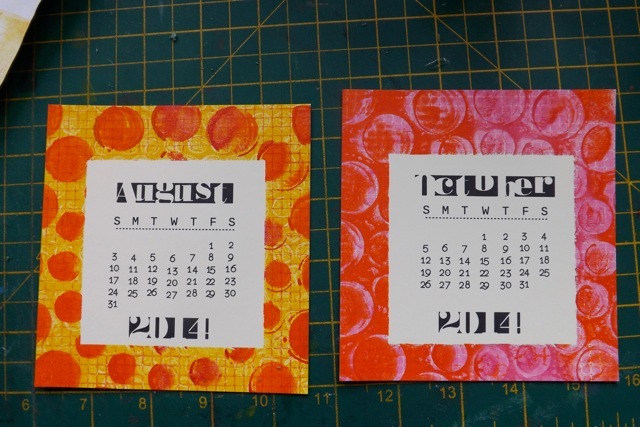 even if you cut out the day grids, with an idea t swapping them around to match the 2014 grids you would still end up with 2013 on them and the dates might never match perfectly. I always planned on updating them for 2014 so that was the prod I needed to do so. 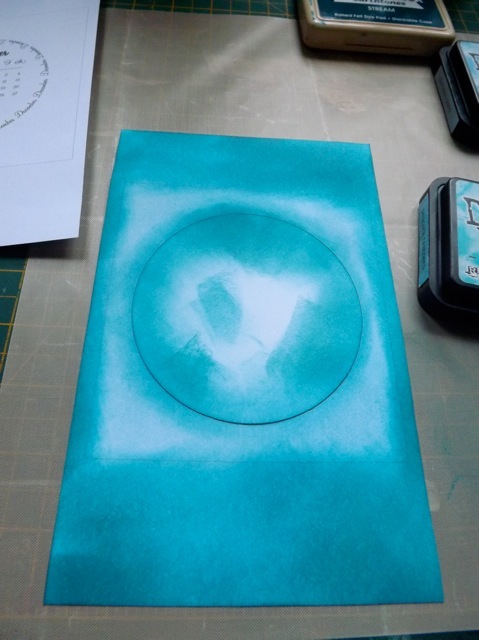 And following thru with my attempt to show actual projects rather than just a screen shot of the printables, I’ve done a few of them to give you some ideas on how to use them OTHER than the standard CS case. Do click up top on the Calendar Making menu item to see the decorated cases thread link – that is still one of my favourite applications. The printables are here. This time I took great care to make sure that the little squared the show the cutting lines for a CD case were exactly the same on each two-a-sheet page. 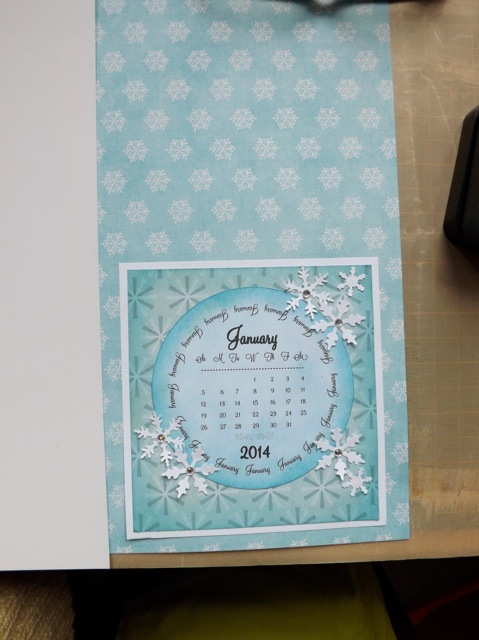 What this allows is for you to cut them apart and (once you sort out the cutting based on what size paper you are using) make something more like a bound at the top flip over calendar. 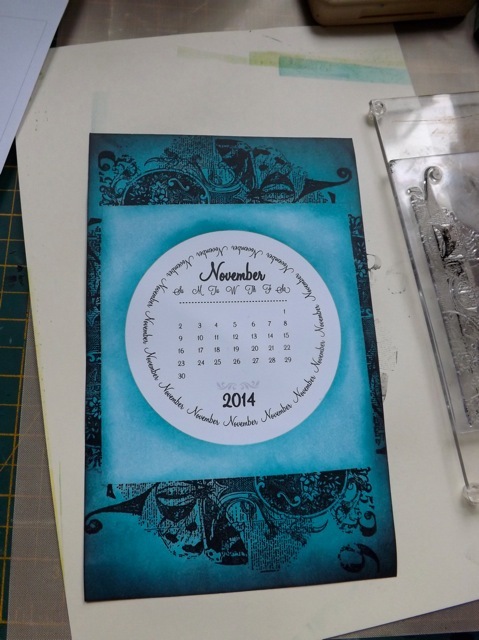 All I did was cut each sheet with the same border around the square then decorate it. I masked off the centre circle, just to make sure the date info was clear. For the first few I did ink and stamping. then added more ink in a darker colour. You can easily do the first 6 months then stick the following months to the backs of them, making a nice flip-over version. 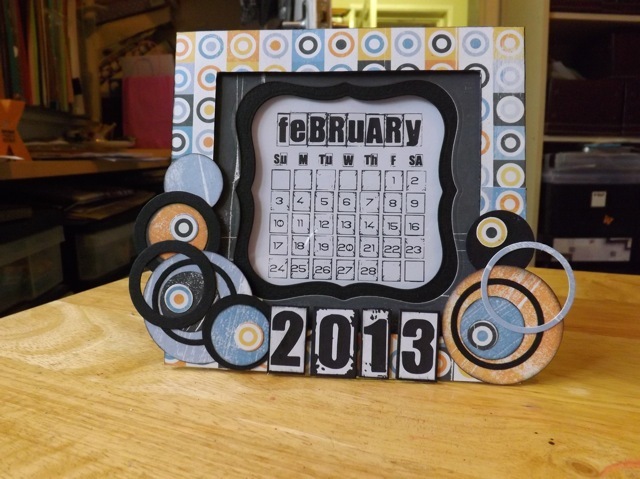 Jan to June then working backwards July to Dec.
You can opt to cut out the circles from the surround, which is going to give you so many more options. Fo this one, I lightly inked the circle then cut it out. 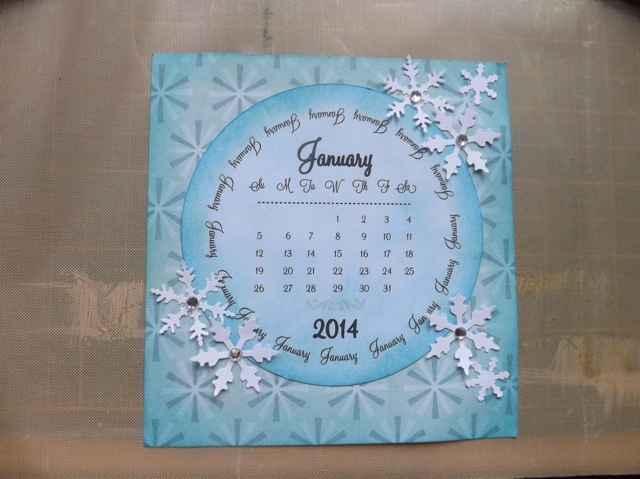 For a more scrappy calendar I just added the circle to paper and decorated that with punches – would have used my snowflake dies but my GC is still out of commission and I’ve only just gotten the email from the UK-based repair place and am awaiting a mailing label. 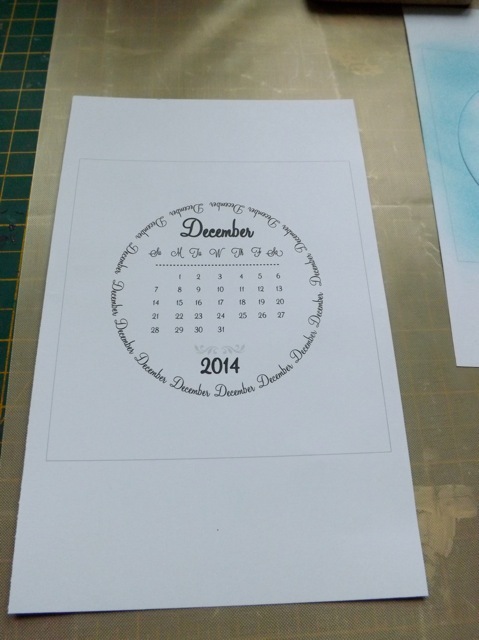 But again, for a bigger calendar you can easily mount the circle, or indeed the decorate square, to a larger piece! 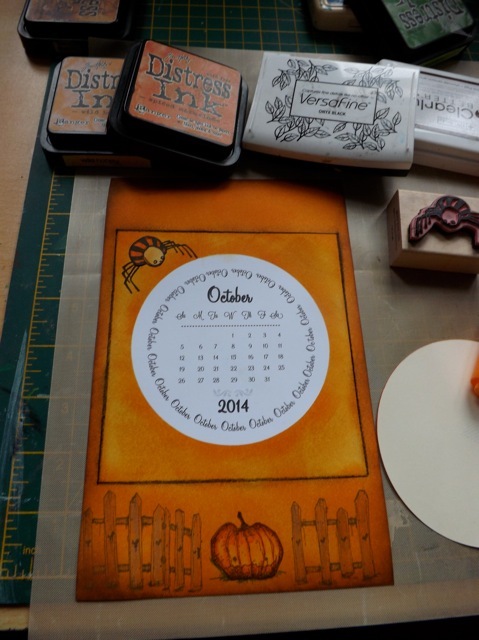 So you get my point – you just have to think a bit outside the box, and not just say Well I don’t really want to make a CD case calendar so I’ll skip these. I do prefer the less pretty font choice. 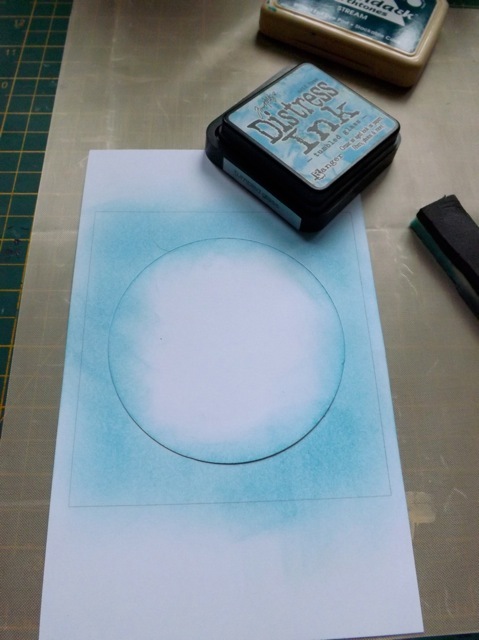 I think I will revamp the circle set to make the font choice feel more … appropriate for Gelli prints, then share them in another post – although to be fair you could simply mask the above set with a circle and get something similar, without the month circle surrounding it. 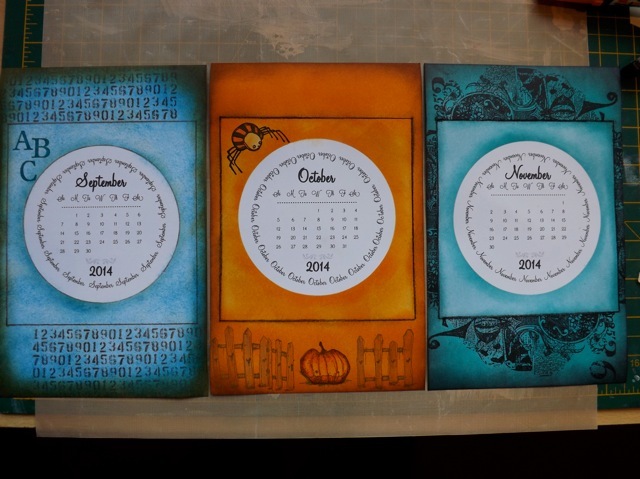 The month blocks are slightly larger than ideal to really show off the Gelli printing with a circle mask, so I’ll think on that. Note: DONE! And download from the post here! 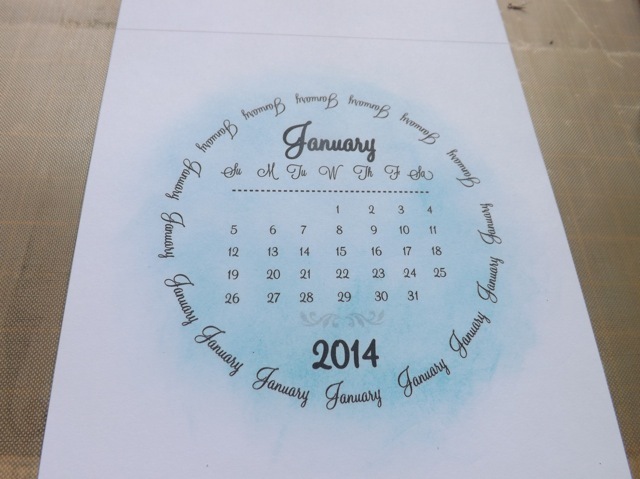 Hope that has given you some ideas for creating your own calendars, for you or for gifts, for 2014! 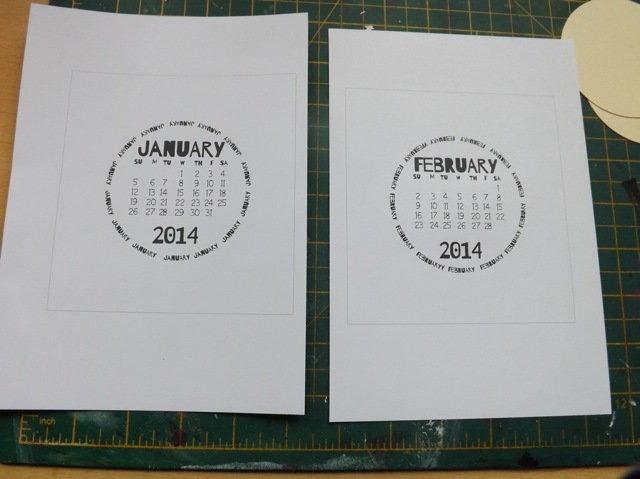 Categories: calendars, printables, tutorial | Tags: calendars, printables, Rubber stamp | Permalink.